Size: 8.5" x 6.5" x 2.2"
Corvus, the consumer division of the famous IC manufacturer MOSTEK, introduced with the Model 300E their first desktop four-function calculator. 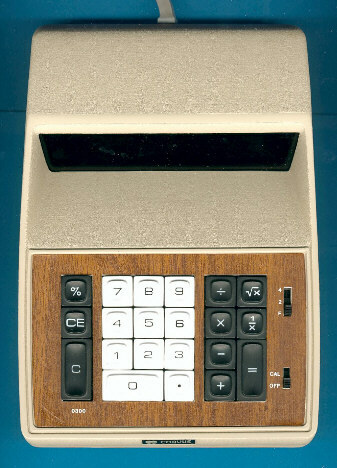 Compared with similar products like the Texas Instruments TI-3000 the Model 300E added square-root, [1/x] and [%] keys. The printed circuit board (PCB) of the Corvus 300E looks really empty with one few electronic components and a big power supply. We are curious about the unusual holes and slits in the lower part of the PCB.